'Reminded me not just what it's like to be young and in love, but what it's like to be young and in love with a book' John Green, author of The Fault in our Stars Eleanor is the new girl in town, and she's never felt more alone. All mismatched clothes, mad red hair and chaotic home life, she couldn't stick out more if she tried. Park is the boy at the back of the bus, Black T-shirts, headphones, head in a book - he thinks he's made himself invisible. But not to Eleanor...never to Eleanor. 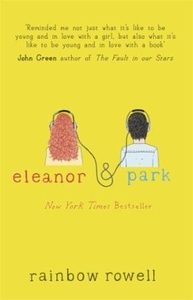 Slowly, steadily, through late-night conversations and an ever-growing stack of mix tapes, Eleanor and Park fall in love. They fall in love the way you do the first time, when you're 16, and you have nothing and everything to lose. Set over the course of one school year in 1986, Eleanor & Park is funny, sad, shocking and true - an exquisite nostalgia trip for anyone who has never forgotten their first love.